House Republicans Renew Opposition to Pritzker’s Tax Hike. In a Capitol press conference on Tuesday, State Representatives Grant Wehrli, Mark Batinick and Jeff Keicher renewed their opposition to Illinois Democrats’ latest attempt to raise taxes on Illinois families and businesses. This latest tax hike proposal, spearheaded by Governor JB Pritzker, calls for removing the flat rate income tax guarantee from the Illinois Constitution. Representative Batinick has remained committed to his opposition to this tax hike, and further expressed his concerns about the effect this tax will have. Batinick discussed the ineffectiveness of the prior tax increases in 2011 and 2017, which have only added to the backlog of debt that Illinois continues to carry. Protections for DCFS and Adult Protective Service Workers pass unanimously. After an almost two year-long journey, legislation sponsored by Rep. Tony McCombie to extend protections to DCFS and Adult Protective Services workers in honor of slain-DCFS worker Pam Knight, received the unanimous approval of the Illinois House of Representatives this week. House Bill 1482 adds protections to DCFS and Adult Protective Service employees from assault, the same protections applied to teachers, police/fire, and other emergency responders who protect those in harm’s way. HB 1482 will now move to the Illinois State Senate for consideration where Senator Brian Stewart has pre-filed to sponsor the legislation. Wheeler bill to remove statute of limitations on prosecuting sexual assault advances to State Senate. The Illinois House of Representatives approved legislation Thursday introduced by Representative Keith R. Wheeler to remove the statute of limitations on prosecuting sexual assault offenses and thereby give law enforcement and prosecutors the ability to conduct an investigation and bring charges against a suspect without a time restriction. The legislation, House Bill 2135, earned unanimous bipartisan support in a vote of 113-0. “Mason’s Law” amendment crafted to meet possible legal challenges. Representative Lindsay Parkhurst has filed HB 2383, legislation dealing with the traffic crime of failing to yield the right-of-way at crosswalks and school zones. The law deals with situations when this crime has been committed and it results in a severe injury or death of another person, such as a pedestrian or an occupant of a smaller vehicle. The bill is called “Mason’s Law” in honor of Mason Knorr, who was killed in a traffic crash in Iroquois County after a semi-trailer truck failed to heed a posted stop sign. Mason had been driving a pickup truck during the fatal 2018 incident. As amended this week, HB 2383 provides for the automatic license suspension for one year, without administrative hearing, of a person convicted of failing to yield the right of way under the circumstances set forth in the bill. Illinois drivers’ licenses are overseen by the office of the Secretary of State. Representative Parkhurst has worked carefully with Secretary of State legal staff to amend the bill so as to craft a measure that will minimize vulnerability to constitutional challenges. Because of the severe penalty imposed under “Mason’s Law,” it is expected that the law will be challenged in court. Rep. Parkhurst, a defense attorney, is familiar with litigation of this type. The amendatory language worked out by Parkhurst, and unveiled this week, is expected to be able to meet potential legal challenges. March 2018 COGFA report. 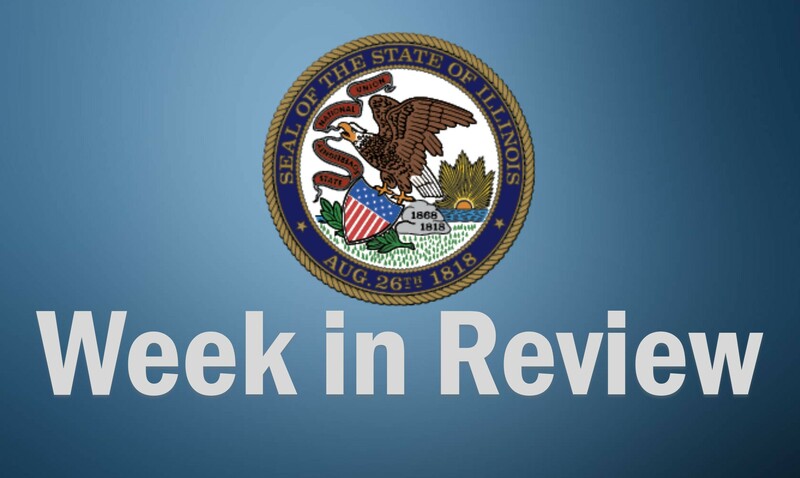 The report on March 2019 State of Illinois cash flows, including “general funds” cash flows, was compiled by the Commission on Government Forecasting and Accountability (COGFA), the nonpartisan budget-monitoring arm of the Illinois General Assembly. COGFA continues to find mildly positive State of Illinois cash-flow numbers. These figures reflect the taxes paid into the State of Illinois, particularly personal income taxes, corporate income taxes, and sales taxes. These three taxes are key generators of money for the “general funds” that carry most of the load of Illinois school aid, prison operations, and other day-to-day requirements of state responsibility. With respect to March 2019, for accounting purposes a key set of comparisons group each line item with the corresponding line item for the previous year. On a year-over-year basis, in March 2019 personal income tax receipts rose $165 million and sales tax receipts rose $63 million. While corporate income tax receipts fell during the same period by $1 million, these signs of strength in two key revenue areas helped lead to an overall increase in State general funds receipts in March 2019 of $275 million over March 2018. The General Assembly will study this report carefully as they continue their FY20 budget work. The COGFA report was published on Wednesday, April 3. Five-year plan submitted for period starting in FY20. State law requires a two-stage program to be carried out every year to organize, and prioritize, the capital infrastructure work of the State of Illinois. This includes spending on roads and bridges, mass transit, school buildings, university buildings, and many other categories. In the first stage, the Governor’s Office of Management and Budget (GOMB) prepares an overall capital spending plan, which looks closely at spending needed in the approaching fiscal year, but also pays attention to the State’s capital spending needs over the next five-years. In the second stage, the nonpartisan Commission on Government Forecasting and Accountability (COGFA) scrutinizes the Governor’s plan and looks at how much capital the State is likely to have available in the approaching fiscal year and over the next five years. COGFA then advises the General Assembly and its members whether the State’s capital resources will be sufficient to meet the needs identified and prioritized by GOMB. The COGFA report “FY 2020 Capital Plan Analysis,” published this week, adds to the growing evidence that Illinois is going to need to raise additional resources soon to meet its need for capital spending. This is particularly significant with regards to road and bridge maintenance and upkeep. Starting on page 51 of the CGFA report, analysts point out that the State’s motor fuel tax rate has remained at 19 cents per gallon since 1991. In Illinois, there have been no increases in this tax rate even as all of the expenses associated with transportation have increased. Since 2013, however, 29 states and the District of Columbia have responded to the same cost pressures by enacting motor fuel tax increases. These increases are structured in different ways across many of the states, but in each case these tax increases have led to rates that average much higher than the tax currently charged in Illinois. Across the 29 states + D.C. enumerated by COGFA staff, the average motor fuel tax is 32.23 cents per gallon for gasoline/gasohol and 34.84 cents per gallon for diesel fuel. Illinois has so far managed to avoid the need for a motor fuel tax increase by enacting ‘tweaks’ to its revenue stream. For example, tax revenue from video gaming terminals throughout Illinois are placed in a State capital projects fund. Money in this fund can be used to supplement inadequate moneys in Illinois’ motor fuel-funded Road Fund. The COGFA Capitol Plan Analysis could contain information to be used as data for advocates of changes in Illinois transportation and tax policy in the closing weeks of the 2019 spring session of the General Assembly. Trout season begins. The 2019 Illinois Spring Trout Fishing Season opens on Saturday, April 6 at 59 lakes and ponds throughout Illinois. Trout fishing locations within Illinois includes deep lakes such as Bird Park Quarry in Kankakee County. Fishing for the well-known sports fish requires both a fishing license and an Inland Trout Stamp. Both credentials are available from the Illinois Department of Natural Resources.